St. Ambrose (c.340-397), bishop of Milan, was, with Sts. Augustine, Jerome, and Gregory, one of the 'Four Latin Doctors' (i.e. teachers) of the Church. In overall appearance this is a typical 12th-century monastic manuscript, though the quality of the handwriting is exceptionally fine. It is included in a catalogue of the books of Worcester cathedral priory, drawn up in the early 17th century, and had probably been there since the Middle Ages. 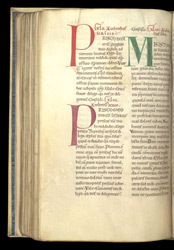 In the margin to the left of the initial 'P' is a letter 'r' (indicating red) and next to the initial 'P' a letter 'p' (indicating purple); elsewhere in the manuscript a letter 'g' appears next to initials in green, but no such letter is visible on this page.